Police departments across the country could soon have access to facial recognition technology in the Breathalyzer tests they give and the body cameras they wear. New innovations in technology are allowing police officers to contribute to a growing database by implementing facial recognition software in Breathalyzer tests and body cameras. 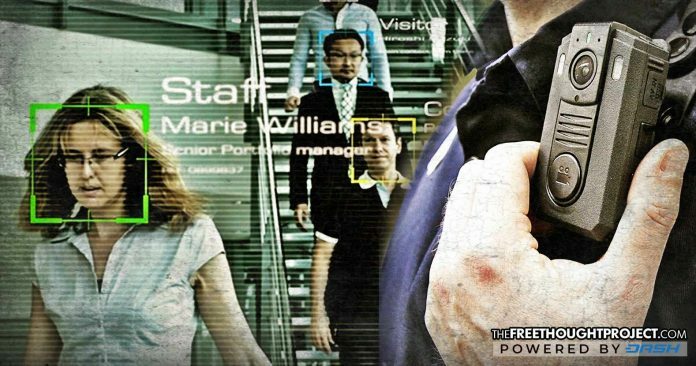 The largest maker of body cameras in the United States, Axon, announced last week that it has purchased two artificial intelligence companies and it is creating an ethics board for the purpose of preparing to use the technology with its current products. Both China and the UK — two major police states — already deploy cameras that use facial recognition in public. Certain products are categorically unethical to deploy. Chief among these is real-time face recognition analysis of live video captured by body-worn cameras. Axon must not offer or enable this feature. Real-time face recognition would chill the constitutional freedoms of speech and association, especially at political protests….Real-time face recognition could also prime officers to perceive individuals as more dangerous than they really are and to use more force than the situation requires. No policy or safeguard can mitigate these risks sufficiently well for real-time face recognition ever to be marketable. But Axon is not alone in their police state profiteering, in order for the prison industrial complex to be fed a constant stream of inmates, allowing prison corporations, county jails, and police departments to profit off of arrests, the charging of an impaired driver must be streamlined. One company believes it has solved the problems that exist with subjective field sobriety tests and faulty roadside drug tests. Breathalytics has developed a kiosk that serves three purposes. It scans a person’s fingerprint, scans their face for biometrics data, and tests their breath for the presence of alcohol, and presumably, drugs. It also records the entire kiosk visit on video. The company calls the kiosk an example of “effortless alcohol screening” and says its kiosk helps facilitate the “alcohol monitoring industry.” Yes, that’s right. Monitoring drug rehab attendees, parolees, work/release, and roadside participants is now being called an “industry.” If for one second you ever wondered what was meant by the term “prison industrial complex,” Breathalytics is a part of that self-professed “industry,” consisting of any business connected to the imprisoning of individuals. Breathalytics is offering its kiosk to police departments, courts, and jails right now as a free trial. The temptation may be too great for some law enforcement agencies to resist. But what are the ethical implications for a sobriety kiosk? Let’s take a closer look at the issues. Breathalyzer claims to calibrate itself and is near foolproof. However, who makes that determination? According to Massprivatei, the source code for the kiosk is proprietary and cannot be independently verified. Who makes such a determination? Blood alcohol content (BAC) rates are often subjective and are not very reflective of a person’s impairment, especially near the United States’ legal limit of .08. Some states are not happy that people are allowed to drink alcohol and drive with a .08 BAC. Many are pushing to have the BAC levels lowered, which could mean that anyone who was caught after drinking one bottle of beer or one glass of wine could be subject to the full ramifications of the law following a DUI arrest. But more disturbing may be the data control implications of a kiosk that records a person’s biometrics, fingerprints, and breath. The Breathalytics machine can also collect DNA if saliva is produced when blowing through the machine. Who ultimately collects the data, stores it, and then keeps it from being used for more nefarious purposes, such as cataloging Americans’ DNA? Do Americans have a God-given right to their privacy? Are we allowed to keep our DNA, our fingerprints, and our biometrics to ourselves? It seems citizens have lost that right. Already, in any international airport in the United States, millions of travelers are having their bodies scanned, supposedly in an effort to sniff for explosives. Remember the time Americans were walking around with explosives in their pockets? No? No wonder! It never happened! The U.S. government used the 9/11 attacks as an excuse to take away Americans’ rights to travel freely without having their privacy infringed upon, by creating the Transportation Safety Administration and implementing full body scanning of individuals who want nothing more than to travel. Now, it seems, the same type of TSA-style spy devices are making their way to the streets with police officers who are encouraged to adopt a breathalyzer kiosk. The machines could easily be installed in the roadside travel trailers police use in DUI checkpoints to charge people with oftentimes frivolous DUI charges that ultimately enrich the police department, the prosecutor, and the industries which benefit from random drug testing and the imprisoning of people in its complex. If police departments adopt the alcohol kiosks they will, in essence, allow a private company to possess nearly all identifying information a person possesses. What could possibly go wrong?